The New York Yankees broke a 2-2 tie with four runs in the eighth inning of Game Seven to win the 1958 World Series, reversing the result from the previous year, capturing the Bronx Bombers’ sixth title of the 1950s, and becoming the first team to win a Series by taking the final two games on the road after dropping three of the first four games. Former Yankee and 1957 World Series hero Lew Burdette toed the rubber for the Milwaukee Braves. Ominously, “[o]nly Burdette draws a cheer when the lineups are announced.”1 He started well, retiring the first three batters. The 1956 World Series hero Don Larsen, by contrast, struggled from the start, giving up a single to Red Schoendienst and a walk to Bill Bruton. Batting third in the order in place of Eddie Mathews for the first time in the Series (Mathews, with only four hits in the first six games, was dropped down to sixth in the order), Frank Torre advanced both runners with a sacrifice. Hank Aaron walked, and Wes Covington put the home team on top with an RBI groundout. New York manager Casey Stengel risked a big inning by ordering the slumping Mathews intentionally walked, but Larsen escaped deeper trouble by fanning Del Crandall. The Yankees recovered quickly thanks to more shoddy defense from Milwaukee. (The Braves had made four errors in Game Six.) After Yogi Berra walked to start the second, “[t]he usually good-fielding Frank Torre messed up two balls around first base”;2 his consecutive errors on tosses to Burdette covering first loaded the bases with none out. Bill Skowron drove home the tying run with a groundout to short, and then Tony Kubek put New York ahead with a sacrifice fly to Covington. Burdette retired Larsen on a grounder to Schoendienst, but had to feel frustrated at yielding two runs on one walk and two errors. Larsen had his lone good inning in the bottom of the second before Burdette pitched around a double by Gil McDougald in the top of the third. Larsen did not survive the third. The Yankees looked to widen the margin in the fourth with an Elston Howard single and stolen base. Jerry Lumpe’s grounder to third failed to advance the runner, however, rendering Skowron’s fly to Bruton harmless. Mirroring Stengel’s strategy and getting the same good result, Milwaukee manager Fred Haney ordered Kubek walked, and Turley hit into a force to end the threat. Neither team had a batter reach again until the bottom of the fifth. Torre walked with one out, but Aaron bounced into a second-to-first double play. Burdette had retired seven in a row when the Braves batted in the bottom of the sixth. With two out, the struggling Crandall, who had stranded six baserunners in his first two plate appearances, homered with nobody on to tie the game, 2-2. Skowron broke Burdette’s steak with a leadoff single in the seventh. Moose went to second with two out thanks to a Turley sacrifice, but Burdette got Bauer to pop to Mathews to keep the score tied heading into the home half of the seventh. Turley got three Milwaukee grounders in a quick frame. Pitching “faster, according to Yogi Berra, who caught him, than he had been in the past,”12 Turley made quick work of the Braves’ 3-4-5 hitters with a 1-2-3 eighth. 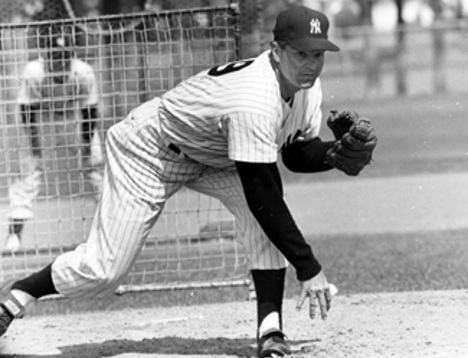 Don McMahon struck out the first two New York batters in the ninth before giving up a single to McDougald and a walk to Mickey Mantle, but Berra’s groundout stranded both. But just as the Yankees had gotten revenge on Brooklyn by beating the Dodgers in 1956 after losing in 1955, New York flipped the script on Burdette and Milwaukee by winning in 1958 after losing in 1957. The Milwaukee Braves would never again make a World Series, and a Milwaukee team would not appear in the World Series again until 1982. 1 Lloyd Larson, “There’s No Tomorrow … Hail the New Champs, the Yankees,” Milwaukee Sentinel, October 10, 1958. 2 Fred Lieb, “Bombers’ Big Comeback Led by Bauer,” The Sporting News, October 15, 1958, 22. 3 John Drebinger, “Yanks Beat Braves, 6-2, and Win Series; Turley, in Relief, Outpitches Burdette,” New York Times, October 10, 1958, 37. 4 Hy Hurwitz, “Yanks Top Braves, 6-2, In Finale to Win Series,” Boston Globe, October 10, 1958, 38. 5 Red Smith, “Spahn, Burdette Deserved Title But Tribe Didn’t,” Boston Globe, October 10, 1958, 37. 6 Richard Dozer, “Skowron’s 3 Run Homer Deals 6-2 Defeat to Burdette,” Chicago Tribune, October 10, 1958, E2. 7 Bob Wolf, “Yankees’ Comeback Equaled Only Once,” Milwaukee Journal, October 10, 1958. 8 Edward Prell, “Turley Holds Braves to 2 Hits after Larsen Fails,” Chicago Tribune, October 10, 1958, E3. 9 Roscoe McGowen, “Haney Credits Yankees’ Hitting and Pitching and Doesn’t Blame His Club,” New York Times, October 10, 1958. 10 Don C. Trenary, “Couldn’t Afford Mistake So We Didn’t Make Any, Chortles Happy Stengel,” Milwaukee Journal, October 10, 1958. 11 Red Thisted, “No Joy in Bushville!” Milwaukee Sentinel, October 10, 1958: 1. 12 Louis Effrat, “Stengel Calls Improved Defense Key to Yanks’ Stirring Series Comeback,” New York Times, October 10, 1958. 13 Arthur Daley, “Return to Normalcy,” New York Times, October 10, 1958. 14 Roy Campanella, “Yanks Colossal, Won Like Champs — Campy,” Milwaukee Sentinel, October 10, 1958.